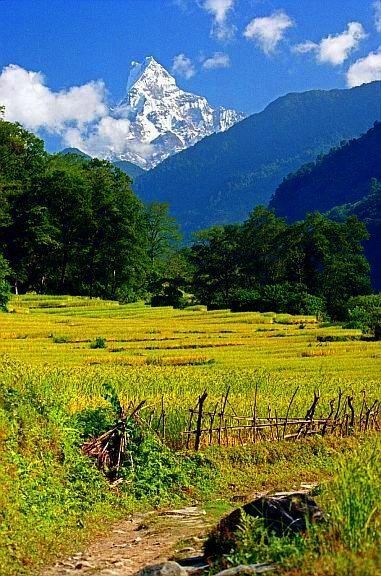 The Himalaya Range is the highest mountain system in the world. 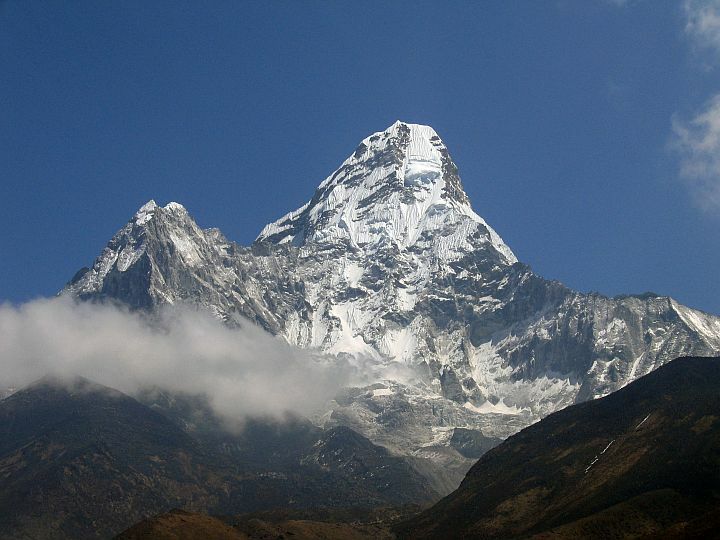 The name "Himalaya" comes from the Sanskrit language and means "the House of Snow," or "the Snowy Range." It consists of several parallel ranges. The mountains extend in a 1,500 mile curve across southern Asia from the Pamirs, west of the great bend of the Indus River, eastward to the great bend of the Brahmaputra River. They form a barrier which separates northern India from the plateau of Tibet. Parts of the range are as much as 200 miles wide. The Himalayas rise in steps from the plains of northern India, which have an elevation of about 1,000 feet (305 m.) above sea level. Mount Everest (29,035 feet; 8,849 m.), which lies between Tibet and the kingdom of Nepal, is the highest mountain in the world. One of the most famous peaks in the range is Mount Kailash (21,778 ft; 6,638 m.) which lies in Tibet. The Tibetans call this mountain Kang Rimpoche (the Mountain of Precious Snow). This mountain is holy to the Hindus and Buddhists and is said to contain the thrones of their gods. Kanchenjunga (28,169 ft; 8,585 m.), the world's third highest peak, lies near Mount Everest. 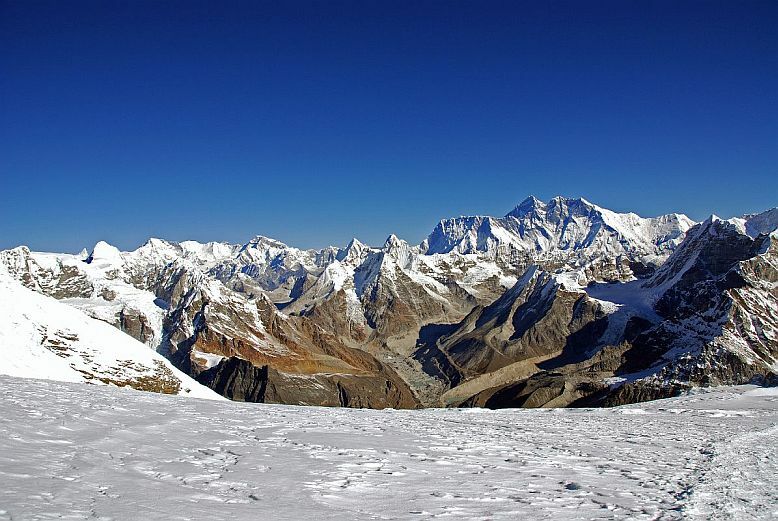 Other high peaks in this range include Makalu (27,825 ft; 8,481 m.), Dhaulagiri (26,795 ft; 8,167 m.), Nanga Parbat (26,660 ft; 8,126 m.) and Mount Kamet (25,446 ft; 7,756 m.). 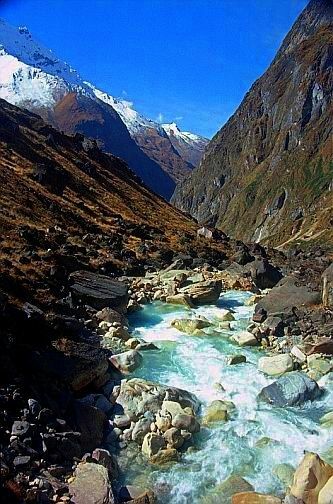 The passes that run through the Himalayas are among the highest in the world. Few of the passes are lower than 15,000 or 16,000 feet above sea level. Most of them are covered with snow from November to May and are impossible to cross. Many glaciers form in the high passes. 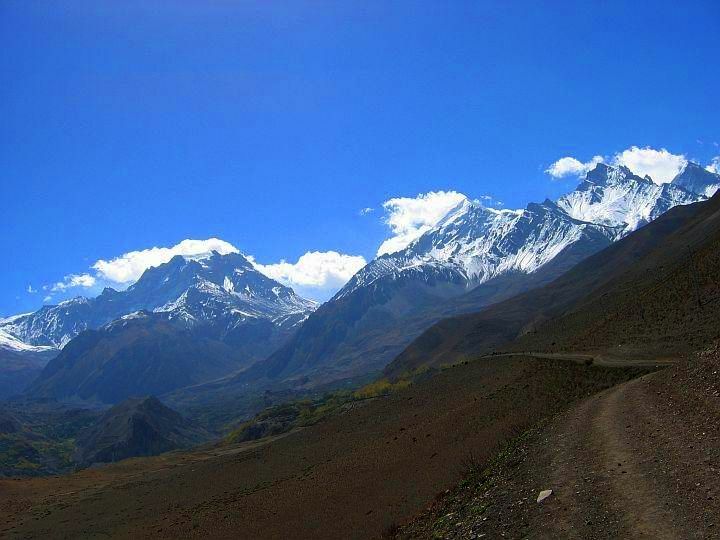 Almost every kind of climate can be found in the Himalayas, because of the great difference in altitude in various parts of the range. This wide range in climate makes possible a variety of plant life in these mountains. On the steep southern slopes grow tropical plants, such as the fig and palm tree. These plants are found up to a height of 3,000 feet (914 m.). Oak, chestnut, and laurel trees are common up to a height of 7,000 feet (2,133 m.). Deodar and pine trees begin to appear at 12,000 feet (3,657 m.). Shrubs and climbing plants are found in great numbers in the forests, and large rhododendrons grow on the mountain slopes. This range is home to many animals that live in tropical, temperate, and cold regions. The tiger, leopard, rhinoceros, elephant, monkey, and yak are also found here.